What means the surname Luther/Luder? Wherethe name luther does come from? With the answers of Günter Luther I don't agree exceptionally. The ancestors of Martin Luther beared the surname “Luder” partly still to his time and in the following generations. Only with beginning of the High German language this changed to Luther/Lutter. If you consider, that the custom of family names was born in the town civilization of Upper Italy in the 8th/9th century, came across the Romanic Switzerland in the 10th/11th century, to Upper Germany 12th century, and then it moved northwards, you can't understand why Günter Luther uses a language, that isn't spoken since centuries, to explain the name. Unfortunately here too he doesn't note a source, where his opinion is coming from. No vocabulary translates 'alder' with 'ludere, ludern'. What was spoken in the 12./13. century? Middle High German! There I have asked these vocabularies too. What I have found? Let us forget it! Everyone recognizes that our current German words 'Luder, Lude' and 'liederlich' here have its root. But was the Middle High German word 'luoder' the origin of the name Luther? To answer this question we have to make us aware, how at all surnames developed and why they developed. The supply of first names was limited, to differentiate the persons, you needed name affixes. For this origin, occupation, physical characteristics was used, in addition, traits, simply everything which seemed helpful. In later centuries the process was similar. In many places there were humans with same first name and surname at the same time. For distinction the affix was selected again , e.g. “the older one, the thickness” etc. One could believe naturally in the fact that the first bearer of the name was a man with a very loose life. However to give to such a man such a surname, he must already have a special social position. Until to the 15th century the lower classes have not had a surname or used it. Thus I do not believe in this root. I have a much better name interpretation: The point of origin. The private domain - that was not only the everyday life, the problems around the family, the joy in the children, which were allowed to play in the work room, but not to loud, and the death in the house. To the private one in his after-dinner speeches also life memories belonged from far days (the monk time 1531, as far was it already away), belonged descriptions of the everyday life with real, sometimes also excessive work, with beer and wine benefit, with the wild dances of the youth in the round, also with pre-marital nightly ejaculations. The circle at table, sometimes large up to 50 persons, could not accuse prudery to their frankly speaking D. Martinus Luther indeed. Such memories he revealed with calm matter of course, also that those one, which he understood to describe better than all other men, the devil, would sleep more frequently with him than his wife Käthe: in bed at home, but also in the rainwater gutter or in the cupboard, smashing pots and dishes. Many friends and assistants from Wittenberg sat with the Reformator in large circle at table together and held extensive conversations and Luther delivered his after-dinner speeches in many cases bequeathed. Some participants took notes eagerly, so the deacon Röhrer, a high-speed writer, but also Cordatus and Veit Dietrich have some logged. Often the reminder of Mrs. Katharina came: "Which it is, that you talk continuously and do not eat?” The meals became cold and the mind heated up in expanded arguments. Who now were the guests, who sat at the table? Above all Philipp Melanchthon, provost Jonas and Caspar Cruziger and Bugenhagen too were the most frequent guests. Yet often the deacon Röhrer, Matthesius, a magister from Joachimsthal, the controller of Count Mansfeld, Goldschmidt, Lukas Cranach with his son, the family of the compositor Hans Lufft, Johann Pommern and the family doctor Dr. Augustin Schurff too belongs to the circle at table. Likewise many travelers, princes and noblemen, cherished to be a guest with Martin Luther, to hear and to attend the solid after-dinner speeches and discussions. It will have also tasted, because Katharina of Bora knew to lead their kitchen. The food note was adapted to the season, fruit and vegetable gave accordingly it to the harvest. Otherwise longer durable and much dried food, like peas, lenses, rice and millet were in the store, in addition, baking fruits, nuts and dried mushrooms, which was supplemented by tubers, beets and carrots. Meat of the cattle and pig was only with difficulty durable, then there was this usually only at the cold season, where also much had to salt. In the warm season came smaller birds, chickens, ducks and geese freshly slaughtered into the kitchen and brought variety in the food sequence. Nearby the ponds delivered fishes; sea-fish, plaices and herrings were rare and came only sometimes with driving buyers from the coast. In the kitchen the spices were particularly important not only to make the meals tasty but also to cover the taste of old meat by a cornucopian addition. There were consumed much not only pepper and salt, also dried, and in particular the season appropriate fresh herbs. Strongly salted bacon and durable resolidified butter, as well as eggs were substantial components of the recipes. Fresh bread, as indispensable supplement to the meal, was baked even in the house. Potatoes were still unknown. Preserved cucumbers and other vegetable, in particular sauerkraut, as well as jams supplemented particularly in the winter the menu. Mostly beer was drunk, which was brewed in the own brewery of the Luther Family. But also wine it gave now and then, partly it was so sour, that it was sweetened with honey. A famulus helped to serve at table and the servant Wolf poured. In the kitchen some menial stuff was employed, which had to took care also of house and garden. Even if only few guests came, then nevertheless pupils and students sat with the Reformator at the table and also the children of friends and acquaintance were as boarders with Luther in the Black Monastery. With them in the summer was held meal in the yard or garden under shady trees before the Elstertore. Beside the own children also nieces and nephews were taken in the family of Martin Luther. As a Luther's sister Katharina, buyer and their man married young deceased, their five Waisenkinder Cyriak, Fabian, Andreas, Lene and Else in the household was taken up. 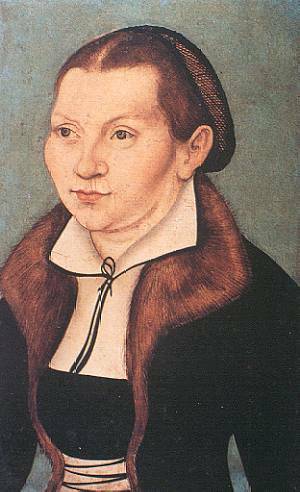 The aunt of Katharina, Magdalena von Bora, attended to the children as good puck “Mume Lene”, until she died in the year 1537. Later still Anna Strauß, the granddaughter of another sister of the Reformators came into the house; the son Martin of his brother Jacob lived here starting from 1538 just like Florian of Bora, the nephew of Katharina, when these came to Wittenberg for studying. With them still Hans Pollner, another sister son associated. Thus also some annoyance came into the house. For this the niece Lene gave particularly cause. Luther must threaten her with to marry her with a black farmhand, instead to trick a pious man with her. Even if no guests were at the large oak table in the family room, the company at table remained large. This enjoyed certainly Martin Luther, because “children bind and are a bond of the marriage and love”, he said and educated them in this sense. "One of the most beautiful and most wonderful gifts of God is the music. Satan is hostile to it, because you banish many contestations and bad thoughts with it. Music is one of the best arts. The notes make the text alive. It hunts the spirit of sadness. The music I had dear all time. Who knows this art, that is of good kind and skillful to everything." Luther said this about singing and making music. He dedicated a song 'from heaven above there I come' to his small daughter Margaretha, the dear 'Matulla'. In the year 1540 'Matulla' Luther got still further play companions with the four children of professor Sebald Münster. For horrifying of the inhabitants of Wittenberg, Luther had taken up these to his house, after their mother had deceased at the plague. The Black Monastery became the example of an evangelic parsonage, where the whole burden rested on the shoulders of the housewife Katharina. She wanted to keep away her husband from all household chores, thus he can dedicate fully to his occupation as preacher, professor and as councellor in great demand. So that no misunderstanding arises, this perception of family is more than 460 years old. It is not my perception of family and it would be also not the perception of family of Martin Luther, he would live today. That I'm convinced firmly. Otherwise I would not have dedicated to him so many years of my life. I did this, although he didn't like or understand really mathematics and I am a math teacher. That may be a comfort to all, which exactly have the same problems. Luther got given 1527 a clock from the abbott to Nuremberg, Friedrich. It is down shown (copied from the Genealogia Lutherorum 1733 of David Richter). "...it is me such very pleasantly, but I'm forced to learn mathematics, until I know the kind and condition of a clock. I did not see such a thing before, also I didn't pay attention to it, because I don't understand math!" The Black Monastery was built up 1500 by Staupitz, with the benefit of the elector, who gave to the house also the right to brew beer. When it was taken over by Luther, it was only built up partly. The church building had been begun only and there were not any household rooms. Thus the residence had still to build up year by year to create place for the many boarders. House and property had been transferred in the meantime to Luther by the duke Johann Friedrich of Saxonia. However a purchase option for state and city remained reserved. Katharina gave a great pleasure to her husband in the year 1540, when she gave the entrance portal from white sandstone to him, that exists still today. Also stables were built up, where a herdsman cared for the pig breeding and where the horses were accommodated. Cows and goats provided for milk. On the monastic yard chickens ran around plentifully. Also the playground for the children was here, that froliced with their arm chests, hobbyhorses and trumpets and drums. A dog could not be missing also. Lippus and Josten, the sons of Melanchthon and Jonas, in addition, whose children Christoph, Sophie and Elizabeth were the play comrades of the Luther children. Of Wittenberg Luther said, it is our market and a dirt and it is expensive too. Gardens at the pig market and at the Eichenpfuhl were at the disposal to the housewife Katharina for their own supply. There were also beehives and a hop garden. Before the town-gate a small fishpond lay. On the market you could receive fruit and some different one. Katharina had to procure seed from Nuremberg. For a long time already Katharina wished to possess, that south the Elbe located property Booss, but she had have any success. Fields north the Elbe Luther did not want to possess, its were too sandy it and with wind its lay nearly completely in air. Then in the year 1540 Luther bought for his wife the small property Zülsdorf of his brother-in-law Hans von Bora. Zülsdorf is located south of Leipzig. It should serve probably rather as old-age residence, as to supply the commom household. But Katharina took care of Zülsdorf too, although it was located two day's journeys far away from Wittenberg. In particular she went to there with her daughters to the fruit harvest. Thus from childhood on the daughters learned housekeeping. But also the sons had to help with the agriculture and on the farmyard. Certainly they were treated in the same way like Hans von Schweinichen, who was deposed once as geese herder, because he had stretched the peckers of all geese by small pieces of wood, so that its would keep silence. There were Small offenses on and off in the house, with which the father had to intervene. The virtue of the children is obedience, meant Martin Luther. Katharina would only too be pleased to manage still another property nearby of the Black Monastry, in order to contribute hereby better to the supply of the large household. She had in mind the property Wachsdorf, that once belonged to the deceased professor Sebald Münster. It was located on the other side of the Elbe, directly behind the bridge. However the chancellor Brück twarthed exceedingly Katharina. Es gehört gar viel in ein Haus. so muß noch viel mehr gehn heraus. [It belongs much into a house. the result should be much more. Martin Luther was often absent from the Black Monastry. Thus it traveled 1540 with Melanchthon to Eisenach, to be closer the parliament in Hagenau. Such journeys made several accomodations necessary, before he was arrived. With the return to Wittenberg he brought always along his wife like his children too something and if it were only a large branch, full with cherries. In the autumn of the same year Wittenberg was infected by a fever, probably a flu epidemic. Also Luther became ill. Bugenhagen had to take over temporarily his duties as pastor. who 1541 moves to Halle with his family, as well as with the high-speed writer Röhrer the Reformator worked at this time on the Bible revision, in which also Cruziger participated. At the beginning of the year 1541 Wittenberg were afflicted by many arsons and poisonings of food. Some of the culprits could be caught and like at that time usual, were tortured and roasted. Those background however were not uncovered. Perhaps it was a kind of religion terror. Anyhow the life in the city became ever more intolerablly. To the 2000 students were now in the city. The eldest son of the Reformators, Johannes, was now 15 years old and came on recommendation of the duke Johann William of Saxonia as well as Clemens of Bora to Magister Crodel to Torgau for studying. Johann Walther trained Johannes in music. The controller Franciscus continued to inform the other children of the Martin Luther, instead to allow them to go to school in Wittenberg. The conditions were there too bad. For the training of his children Luther employed still the paedagogues Hieronymus Weller from Molsdorf, George Major and Franz Bock. The colleague of the Reformator, George Major, prepared later Johannes for the examen for the magister degree. On 20 February 1541 Lucas Cranach the younger one at the age of 25 years married the daughter Barbara of the Saxonian chancellor Georg Brück. For the family of the chancellor Brück existed already since 1534 by the marriage of Barbara Cranach with his son Christian a family connection. Käthe (Katharina) Luther arranged a meal with few tables for the bridal couple and the guests in her house. The actual wedding was in Wittenberg outside of the Black Monastery. Katharina took care particularly for the Cranach family because shortly before the wife of Lucas Cranach the older one, Barbara Brengbier, was deceased . The whole celebration in the house to have, would have been however a too large burden. Because the same reason Caspar Cruziger married for the second time in the castle Eilenburg. In 1st marriage Cruziger was married only shortly with Elizabeth von Meseritz. From her the song comes, that Luther let set into his hymnal: 'Herr Christ, der Einige Gottes Vater...'. She had a son and died 1528. In the year 1541 Luther bought Bruno's shack for 430 florins, the florin with 21 silver pennies. It was a small house directly beside the monastery at the Kollegiengasse. The sales contract with Bruno Brauer is received. Luther paid the purchase price in rates. The house had to be repaired still for some florins, before it could be given as fiefdom to the servant Wolf Sieberger.